A poetic wildlife documentary about the search for a lost childhood memory in a tidal area. ‘Wadland’ explores tide and time in this natural space around the edges of the Dutch island Terschelling. Winner ‘Best Film’ in the ‘Delta Young Talent Competition’ at the Film by the Sea Film Festival 2012. Nominated ‘Best Cinematography’ at the SFFL 2012 and Film by the Sea 2012. 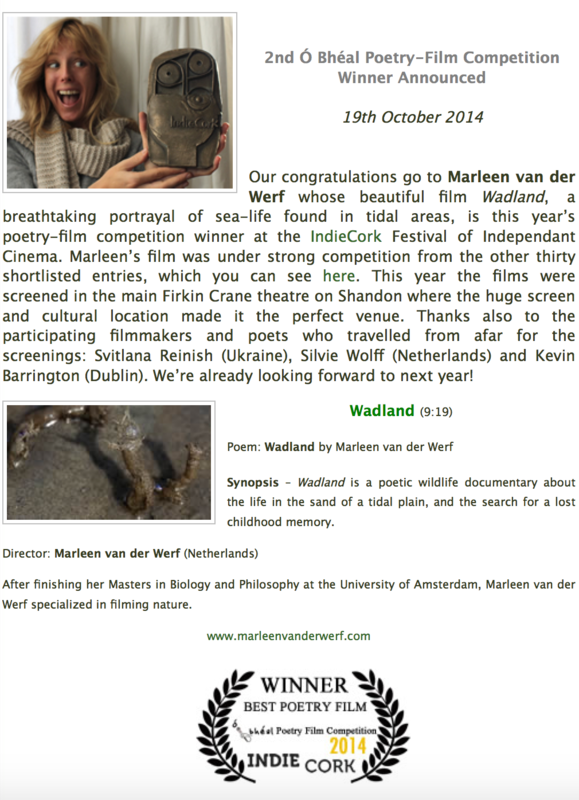 Wadland | Marleen van der Werf | Teaser from Wild Work Productions. North Sea Film Festival – 10th of November 2012 in Rotterdam. Kunst10daagse Bergen – 19-28 October 2012 in Bergen. ZEBRA Poetry Film Festival – 18-21th of October 2012 in Berlin. SOMNIO Film Festival – 22th & 23th of September in Alkmaar. Student Film Festival London – 4th of February 2012 in London. Film by the Sea in the Delta Short Competition– 16th of September 2012 in Vlissingen. ‘Wadland’ (9min36) has been broadcasted by ‘Omroep Zeeland’. Parts of the documentary Wadland where shown as part of Oerol-tube during the Oerol festival on Terschelling. Some images from the film ‘Wadland’ have been included in the Channel 5 programme ‘Robson Green Extreme Fisherman’. Wadland is a graduation film for the Master in Wildlife Documentary Production at the University of Salford, UK by Marleen van der Werf. The music is made by Dennis van Tilburg. With special thanks to Misja Pekel. Wadland is a Wild Work Production.